Park County tornado near Eleven Mile Reservoir. Image courtesy 7News and Jerry Bivens. 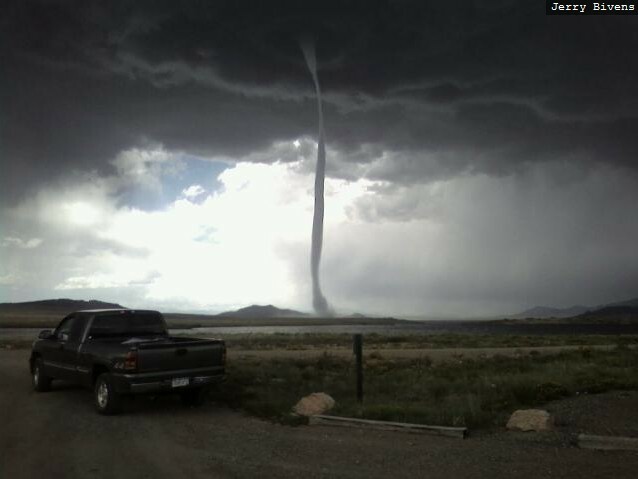 In a truly unusual weather occurence, a tornado struck near Eleven Mile Reservoir in Park County Saturday afternoon. Certainly we are all used to hearing about twisters along the Front Range and on the plains but mountain tornadoes are quite rare – the rugged terrain usually disrupts the weather patterns necessary to product tornadoes. Authorities estimate five vehicles were damaged including a motorhome and pickup truck camper that were overturned, a trailer was destroyed. Beyond cuts and scrapes, thankfully no one was injured. Colorado is ranked ninth in the country with an average of 40 tornadoes a year. It is interesting to note that every state in the union – including Alaska and Hawaii – have had tornadoes. It does serve as a reminder that while the unofficial severe weather season is behind us, Colorado’s weather is anything but boring and everyone should be aware of all the types of weather hazards that are possible. This entry was posted on Sunday, August 24th, 2008 at 3:18pm MDT and is filed under Colorado Weather, Severe Weather. You can follow any responses to this entry through the RSS 2.0 feed. You can skip to the end and leave a response. Pinging is currently not allowed. On 8/18/2007 I video taped a tornado west of Idaho Springs in clear creek county Co. check clear creek courant. We just checked the paper’s website and can’t seem to find the video. We would love to share it. Can you post a link? I filmed a tornado at 11 Mile State Park on August 18, 2009 at around 1:27pm. There was a NWS tornado warning for Park and Teller Counties at the time. I filmed another tornado (confirmed by first had accounts and damage assessment EF1) near the town of Lake George. I was later informed that mountain tornados have occured in the 11 Mile reservoir mountains, west of Wilkerson Pass in previous years. This is an intersting frequency.